On the day that I happened to visit Tallahassee last summer, a group of student activists who call themselves The Dream Defenders were going into their 3rd week of physically occupying the lobby to Governor Scott’s Capitol office in protest of the recent acquittal of George Zimmerman in specific and the Stand Your Ground law in Florida in general. 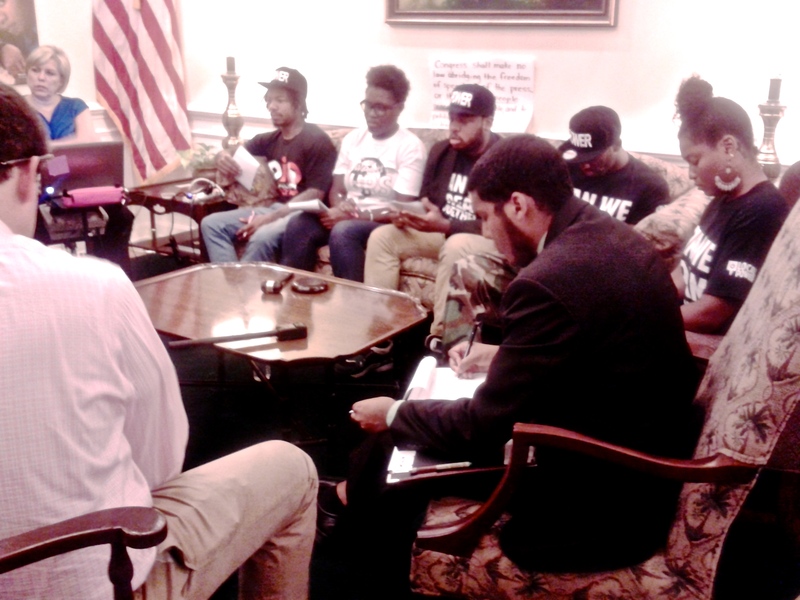 The Dream Defenders, who were principally students from Tallahassee’s two main universities, Florida State and Florida A&M, had set up a mock legislative “People’s Session” in the governor’s office, inviting in civil rights leaders, academic experts and local citizens to come share testimony as to their experiences with racial prejudice and injustice in the State of Florida. When I showed up at the Florida State Capitol, the Dream Defenders were discussing the problems concerning what has been colloquially called the “School-to-Prison Pipeline”, a phenomenon that has essentially prepared millions of impoverished and minority children in America for correctional facilities as opposed to universities. Part of what made this people’s session so interesting is the fact that it was actually taking place in the lobby of a working governor’s office and, therefore, the usual business of government was trying to continue to take place around them. As students were giving testimony about being arrested at school for coming to class late or for “passing gas excessively,” and the Vice President of the Florida NAACP was talking about the funding flaws inherent in the Safe Schools Act, a steady stream of white folks in pinstripe suits and pleated skirt suits would pass by the rabble to let the receptionist know that they were there, which would prompt some administrative assistant to come out and give them the country club handshake before taking them through the double doors that led to the office proper. Naturally, when 5 members of the Florida Congressional Black Caucus came into the office to try and advocate for Governor Scott to call a special session of congress to debate the future of the Stand Your Ground legislation, the double doors did not open, no hands were shaken and the representatives had to be content to simply read their letter aloud to everyone gathered in the lobby and leave. I soon followed the Florida Congressional Black Caucus members’ lead and left the governor’s office so that I could grab a coffee with Nisah, a woman who I had met in Baltimore two years earlier while we were getting our masters degrees in social work. Nisah was born and raised and now works in the Philadelphia area, but had gotten her undergraduate education at Florida A&M, a historically black college that shares Tallahassee with Florida State University. Florida A&M, also referred to informally as FAMU, has long been considered one of the best historically black college’s in America and was actually named “College of the Year” by Time Magazine and the Princeton Review College Guide in 1997. Unfortunately, the school’s successes have recently been overshadowed by a glut of national news coverage surrounding the hazing death of drum major Robert Champion, a member of FAMU’s famous band, the “Marching 100.” The band returned to action last year after being on a two year probation, but the university itself is still reeling. If I were to describe Nisah in word, it would probably be “polished.” She is the type of woman that would’ve been head of the debate team in high school and probably has,“most likely to succeed” under her name in her senior yearbook. Now, were I to actually say this to her face, she would undoubtedly become self-deprecating and try to downplay her achievements and demeanor, at which point I would remind her that she was one of two students picked to give a convocation address to the entire school at graduation and then do the Cabbage Patch for an inappropriate amount of time. By way of contrast, I feel I should mention that I was listed as “most likely to runaway and join the circus” in my high school yearbook. We work with what we’ve got. “Wow. She kept y’all busy.” I said. “Did you have a curfew?” I asked. “Well, if you grew up outside of Philly, what made you decide to go to school down at Florida A&M?” I asked. “What was the biggest takeaway for you after being in South Africa?” I asked. “So, it wasn’t exactly what you were expecting when you decided to do service work in the Africa?” I asked. I live in the South, I was born in the South, and except for one particularly harsh winter spent in Boston back in my misspent youth, I’ve always lived in the South. What I have continually seen is very segregated populations – the neighborhoods are either “black” or “white” and so are schools, businesses, community resources. It’s confounding and disturbing so many years after civil rights to see this, year after year.